Axair Fans has established long term partnerships with manufacturers ECOFIT s.a. (France) and ROSENBERG Gmbh (Germany), and are now able to offer Energy Efficient EC fans and air movement products. Both Ecofit & Rosenberg develop and manufacture their own motors and fans. The Ecofit EC range use motors from 65 up to 113Wa, the Rosenberg range use motors from 1.1 up to 3.4Kwa motors. EC Technology stands for Electronically Commutated and combines AC and DC voltages, which is essentially a fan with a brushless DC motor, bringing the best of both technologies: the motor runs on a DC voltage, but with a normal AC supply. DC motors already have low power consumption but if used in an AC application, the power needed converting AC to DC, using a bulky, inefficient transformer. The EC motor incorporates voltage transformation within the motor. The non-rotating part of the motor (stator) is extended to make room for an electronic PCB board which includes power transformation AC to DC, as well as the controls. All the features of the external rotor motor are kept, including compact assembly, easy speed controllability, efficiency and characteristics. With an EC motor the electronic circuitry stands in lieu of the traditional mechanical commutation meaning the right amount is being supplied in the right direction at exactly the right time providing precise motor control. Control : 100% speed controllable, not frequency dependant. Can be set-up for constant airflow or constant pressure applications, 0-10VDC or PWM control signal. Easy connection : No complicated wiring and set-up with a Frequency Controller, EC fans have very little configuration. 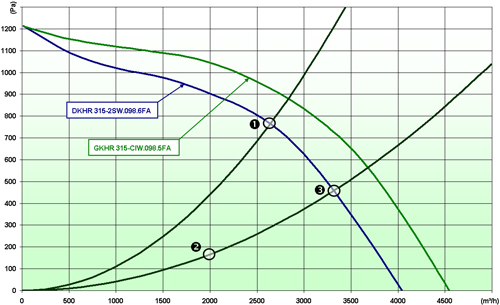 EC technology motors have a near flat efficiency curve which barely varies across the speed range. A range of which is not limited by synchronous speeds or susceptible to voltage variations like its AC counterpart. 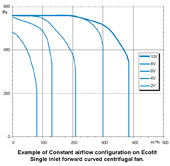 Its AC equivalent will operate at a precise point on the curve which equates to its maximum efficiency, either side of this point and the efficiency diminishes. By comparing 2 backward curved centrifugal impellers, one in AC and the other in EC. The data for the AC fan is the consumed fan power and excludes losses from any inverter or controller necessary to control the fan. Let’s assume a laminar flow workstation requiring 13200m³/h at 450Pa. This requires 4 off Ø315 backward curved fans. Now let us assume that this workstation operates for 50 weeks of the year and for 8 hours per day at full speed. During non working hours to maintain the work area, the fans are run at roughly half the airflow. 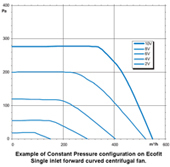 Constant pressure : Used in conjunction with a pressure sensor, the fan maintains the same pressure at varying airflow (ideal for ducted applications). Operates with forward curved centrifugal fans without pressure sensor and with backward curved motorised impellers with pressure sensor (Available on Ecofit fans). Constant airflow : The fan maintains the same airflow at varying pressure (ideal for filtered applications) (Available on Ecofit fans). Master/Slave : This system is used when several fans are used together within a single application. The main fan (Master) is individually pressure controlled. The other fans (slaves) are then speed controlled by the Master fan : Slave Fans are always at the speed of the master fan (Rosenberg Versions only). Backward curved motorised impeller. Available in diameter Ø192, 220 & 225. Forward curved centrifugal fan, Single inlet. Available in Ø160. Constant pressure or airflow configuration available. Forward curved centrifugal fan, Double inlet.Available in Ø160. Constant pressure or airflow configuration available. Backward curved centrifugal motorised impeller. Available in Ø280, 315, 355, 400, 450, 500, 560 & 630. Can be used in the ECFanGrid. Backward curved centrifugal fan – Single inlet. Available in Ø280, 315, 355, 400, 450, 500, 560 & 630. Axial fans – Available in Ø630, 710, 800, 900 & 1000. Several configuration available. UNOBOX extraction / Ventilation units. Available in 4 sizes, Fitted with motorised impellers Ø355, 400, 450, 500, 560 & 630. Rectangular In-Line Duct fans. Available in 4 sizes, Fitted with motorised impellers Ø355, 400, 450, 500 & 560. Roof fans with vertical discharge. Available in 3 sizes, Fitted with motorised impellers Ø355, 400, 450, 500, 560 & 630.